What a difference this year has made. Not A year, but THIS year. Last year I wrote about Halloween being the hardest day of the year for me. This year I feel very differently. I just reread last year's post and it definitely brought all of those feelings back, but that's not what I was feeling today. I just stayed busy with school and did what I had to do. This year is so different. For a little over a year now I've been plodding along in school, working my way through the coursework. I've pretty much hated it (school, not the profession and information), but I can see the end now. I can hear everyone trick-or-treating outside right now and I'm glad. Halloween is so awesome, especially when you're a kid. What Happened to My Friends Without Kids? Okay, honestly, that is a rhetorical question, one I will answer at the end of this post. But I cannot count the number of times I asked myself this question while I was deep into the hardest years of my infertility. Sure, my friends with babies and kids had all moved on in their lives. While it hurt that they no longer made time for or seemed to remember me, it somewhat made sense. But what happened to my friends without kids? I am writing this post in case it helps anyone else that may be facing this issue. In particular, I had two extremely close friends without kids: two women that I had been friends with for over ten years. One was married but didn't want kids. The other was single and not trying for kids. They both knew, from the time we had met, that having children was my lifelong dream. During my darkest years, they were nowhere to be found. I felt so lonely and, honestly, sorry for myself. So, over time, I have become more compassionate with myself. Instead of questioning myself and thinking "I could have done this, I could have done that," I remind myself that I did the best I could at the time. As women who had never unsuccessfully tried to get pregnant, they could not relate to my pain at all. Maybe they thought I was whiny? Or depressed without reason? Selfish for wanting kids in the first place? Maybe they honestly could not understand why I just "couldn't get over it?" It is possible that jealousy played a factor. Maybe my single friend thought I should just appreciate what I did have- a loving marriage, and maybe my married friend thought the same- that I should just appreciate that I had a stable roof over my head. But what I really and truly think was at the root of it all was that I had changed. Dramatically. A person cannot go through that level of loss and trauma without changing. I was no longer the woman that they had known. Instead of giving all of my energy to them (which I did, which was not their fault, those were choices that I had made), I had to reserve most of it for myself. Instead of driving to where they lived (thirty minutes for one, over an hour for the other), I stopped. I hoped they would come see me, but neither one of them ever did. Overall, I had completely changed the patterns in our friendship, so of course the relationships didn't work anymore. I thought the friendships were strong enough to survive these changes, but, unfortunately, they were not. I wasn't the same person anymore and that, apparently, changed everything. I have often hinted on this blog that infertility taught me the boundaries I desperately needed in my life. For that, I am grateful. But, at times, it was almost too much loss at once for me to handle. I continue to deal with loneliness on a regular basis, but blogging and "meeting" all of you has really helped. I try to socialize once a week. That is not always possible, but going back to school has helped. (Although I enjoy my classmates in their early 20s, I also really miss my peer group.) I am eating regularly, sleeping well, and exercising several times a week. In other words, I am doing the best I can. I have never really been good at letting old friendships go, but I am dealing with it. I miss them and I wish them well. And that is what happened between me and my friends without kids. I was so tired yesterday that I forgot to tie in a couple of other points. I am tired of hatred. I am tired of racism. I am tired of misogyny. I am tired of gun violence. I am tired of divisiveness. I am tired of infertility. I am tired of the lack of empathy. I am tired of the loneliness it brings. I am tired of the the Martyr Mommy trope. I am tired of getting treated like crap in my school program. I am tired of my husband getting treated like crap at his job. I am tired of where we live. I am tired of what we are doing. We are too old for this. We have worked too hard. And then, on top of everything else, Tom Petty died. He was/is my most favorite musician of all time. I have all of his albums and I listen to him on a weekly basis. I was crushed by his sudden, unexpected death on an already tragic day. But he gave us a lot of awesome music before he left us. And his lyrics always made me feel understood. Tom Petty has given me so much comfort throughout my life. His music got me through adolescence. His music got me through infertility. My husband and I even danced to one of his songs for our first dance at our wedding. (That was also our last dance, as neither one of us are dancers hahaha.) Tom Petty has been the soundtrack to my life. So even though I am tired, I will push on. There are lots of good people in this world and we can't let the negative news cycle infiltrate our brains any more than it already has. Please allow me to share with you my most favorite Tom Petty song. I hope you have a very happy and/or relaxing and/or content Sweet Sunday (←that's a reference to the board game Payday if you ever played that as a kid...). I truly believe there is Something Good Coming. Wow. These past two weeks have been so busy. "Tired" is such a boring title for a post, but that is how I am honestly feeling. And this is the longest I've gone between writing posts since I started this blog a year ago. Usually, I try to post at least once a week. The first week of October I spent almost 50 (unpaid) hours in a hospital doing one of my clinical rotations. That was interesting, informative, and exhausting. The second week of October was full of exams (with more to come this week). I don't want to discourage anyone from going back to school, but this is all certainly easier when you're younger! Yes, the need for my blog is still here. I am reminded almost every day. So I will keep writing. My week at the hospital gave me a taste of the working world again. Last time I was employed was before infertility, so the next time I am employed it will be my first job after infertility. One day, I came home pretty frustrated and told my husband that I wished I could work somewhere with all men. Knowing how important girlfriends and conversation and connection are to me, he was surprised and asked, "Why?" And I said, "Because most men don't talk about their children all the damn time!!" There was one day when a group of employees were gathered around one woman's desk watching a video and laughing. Turns out it was a video of her little one. I had already noticed this woman's desk included a copy of her Happy Mother's Day card that she sent out to her friends and family full of pictures of her pregnant and with her baby, so my guess was she was the biggest Mommy of them all. And, overhearing her talk all week just proved my point. So, anyway, I guess this video showed her kid doing something cute/funny/adorable because everyone was laughing. And then she said (in good nature I think, it seems like most everyone got along, but what she said still annoyed the crap out of me), "All of you people without children don't know what it's like! Just you wait!!" Good thing no one was paying attention to me because I just rolled my eyes. But I know I will have to sometimes stomach comments like these when I return to the workforce. And I am not looking forward to it. Even though every year I make great strides in my recovery, I still anticipate that I will always miss my children. So I may always have this blog. It seems there will always be something that stings. And even if I get to a point where stuff doesn't sting anymore, I know there are others out there reading our blogs and what we are all writing is helping them. I want to live a life of service, so if this is how I can help others then I will keep writing. I can barely believe I started a blog, much less that I started a blog one year ago. First of all, to anyone reading, THANK YOU. Thank you for being in community with me and others living life without children after infertility. Like Klara at The Next 15000 Days told me it would be, writing has been very therapeutic. This is not an easy life to live. I still think of my children every single day. I know what their names would have been and I know how old they would be. I don't socialize with any of my former longtime friends. Our lives have gone in completely different directions. And although we are close and I get along with them, I still have not received much empathy or understanding from my family over what I have lost. Again, it is not an easy life to live. It can be lonely, sad, and frustrating. But I am working hard to create a life I will enjoy. This time next year I will be finishing up my school program while living and working in another state. 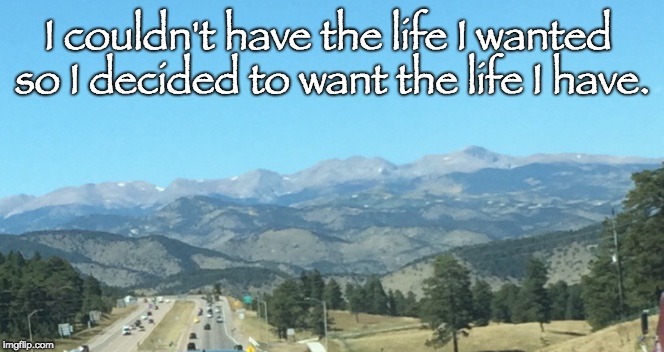 I did not think it was possible to live a happy life after infertility, but it is. It is, it is, it is! Even if you don't believe me right now, it is entirely possible to enjoy life again. I promise you that miracles do happen. My husband and I are playing the long game. We could have just up and moved several years ago, but we're trying to be strategic about it. Life is expensive and I wanted to get a new career, one that I enjoyed and one that hopefully pays just a little bit better. However, I am getting really tired of our pragmatic approach. I am anxious to move NOW. But I am proud of us for going the delayed gratification route. We are going to be in a much better place when we move next year compared to what it would have been like if we had moved several years ago. So in the meantime, I went back to school, got slammed with homework, and decided to start a blog amidst all my millions of deadlines. I am so glad I did. So, I'm not going away. My infertility isn't going away. And there's only more people joining us in this childless/free-not-by-choice circumstance, so I think we should all just keep showing up for each other. And one day we are going to get together and have a massive party!! !